I’ve been reading a prepublication copy of a book titled Explaining Divergent Levels of Longevity in High-Income Countries, published by the National Academies. It’s chock full of interesting data, so it’s likely that I’ll be posting on it a number of times in the near future. Many of you don’t like comparative health data between countries, but I maintain it’s invaluable. I concede that individual data points and cherry-picked data can be manipulated, but thoughtful analyses can tell us a great deal about our health care system. What I find interesting is the stark contrast between those who graduate from high school and those who do not. There is a difference between those in the lesser two educated categories, but this is dwarfed by the difference between those who make it into higher education and those who don’t. 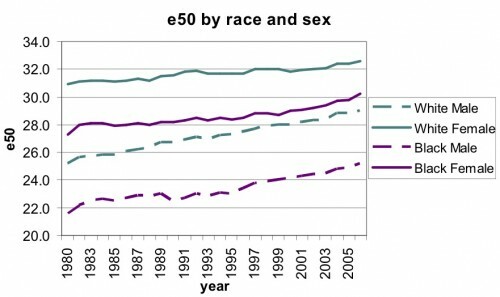 What’s interesting about this one is how consistent the racial differences are over more than 25 years. 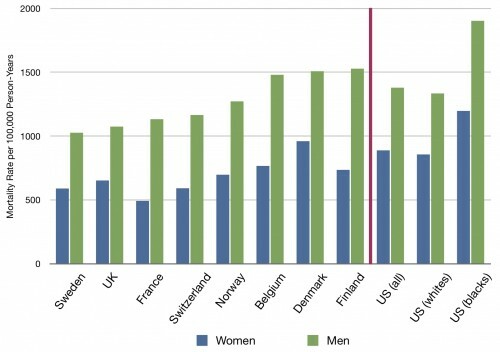 There’s very little closing of any gap between races in either gender. It’s not just that the US does surprisingly badly overall; it’s how much worse blacks in the US fare compared not only to whites in the US, but also to every other country. Life expectancy is not a good measure, especially across countries because of widely varying standards for what is considered a live birth and accuracy in data collection Because the US counts extremely premature births where other countries don’t, it skews our results significantly downward. I also would like to see how much of the difference between whites and blacks in the US is due to premies. many of which are born to teens. I encourage you to look more closely at the graphs. NONE of them are life expectancy at birth. Premies have absolutely nothing to do with any of these data. 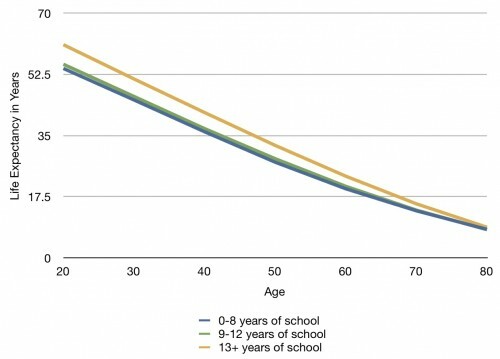 The life expectancies at age 20, 30, 40, 50, etc. are not dependent on the definition of a live birth. Yes and Aborigine males and Australia have a life expectancy below 60 years. On the other hand Mexican Americans live longer than whites. And according to The “Eight Americas Study” poor rural northern whites, with less than average access to health care, out live the USA average. According to below, in poor areas of Scotland male life expectancy is as low as 54. TODAY, The Scotsman reveals the true extent of inequality across Scotland, in a devastating study showing the country’s wealthiest suburb has a life expectancy of 87.7 years, while a boy born in the poorest area of Glasgow can expect to die at 54. I do not think that the cause is health care. So what to do?